No. 1 seed Seattle lost 86-66 on Friday night, but still has a 2-1 lead over No. 5 Phoenix in the best-of-five WNBA semifinals. PHOENIX – Following Friday’s demoralizing 20-point defeat, Dan Hughes reminded the Storm of a few important facts. For starters, top-seeded Seattle still leads No. 5 Phoenix 2-1 in their best-of-five WNBA semifinal series. 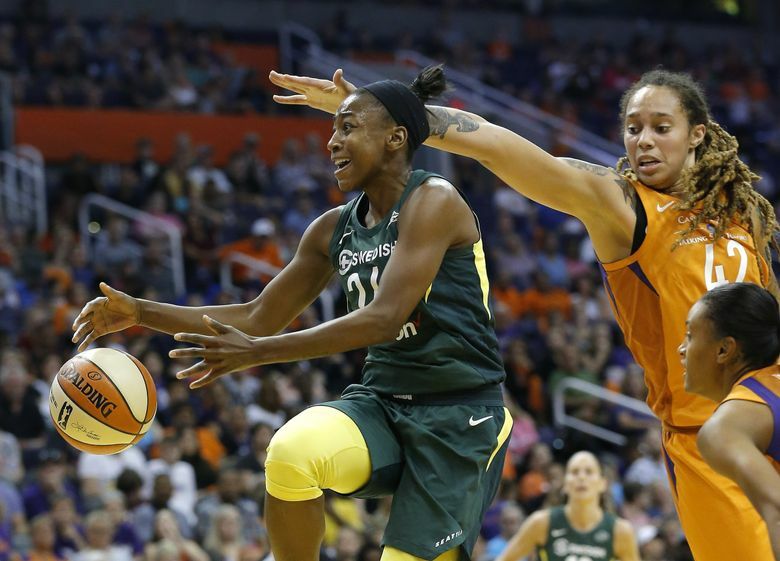 The Storm remains in the favorable position of being able to secure a berth to the WNBA Finals with a win 2 p.m. Sunday at Talking Stick Resort Arena. It’s highly unlikely Seattle’s All-Star backcourt of Sue Bird and Jewell Loyd will replicate Friday’s abysmal performance when they combined for two points on 1-for-18 shooting. And the Storm is the only team in the WNBA that didn’t lose consecutive games in the regular season. “I reminded them of what’s been our response to losing and told them to stay in character,” Hughes said. “I’ll do a couple of things to help them with what we’re dealing with, but mostly I’ll remind them of what our strengths are and how we’ve responded as a team to adversity before. Bird echoed those sentiments and the 17-year WNBA veteran intends to quickly forget her scoreless outing on Friday. “I just missed shots,” said Bird, who was 0 for 8 from field and 0 for 5 on three-pointers. “It’s not some larger problem. I missed a layup at the end. At that point I was like, OK so this is how it’s going to be and that one made me laugh. At the start of the season the Storm adopted Bird’s mantra, which is to always focus on the next game and never dwell on the past. That philosophy helped Seattle capture the best record in the regular season at 26-8 and Bird, a two-time WNBA champion, repeated her message in the locker room after Friday’s 86-66 defeat in Game 3. “This is what playoff basketball is all about, there’s a ton of highs and lows in them and it’s more of a mental game than anything else when it comes to how you’re feeling and how you react to what’s going on,” Bird said. “That’s what series are. They can get you thinking about things you have no business thinking about. Despite the ebbs and flows in a series that produced two nail-biting finishes in Seattle last week, there has been two constants: The Storm’s inability to score in the fourth quarter and DeWanna Bonner’s brilliance. And yet inexplicably, the Storm consistently falls flat in the final minutes and is being outscored 25-11 in the fourth. Hughes hopes the Storm’s inability to get to the free throw line doesn’t become another disturbing trend on Sunday. On Friday, Seattle attempted a season-low five free throws and made three. No starter took a foul shot while Phoenix was 8 for 11 on free throws. Phoenix held Seattle to a season low points in large part due to its ability to curtail the Storm’s leading scorers. WNBA MVP Breanna Stewart tallied 15 points on 7-for-23 shooting and Loyd connected on 1 of 10 shots for a career-playoff low two points. “I was short on my shot and probably just rushing a little bit,” Loyd said. “They were playing me aggressive. (Briann January) is a really good defender and her job is to make my life miserable.